Well, I think my top would be the all-Damascus, Ricardo. That one looks to be very impressive. (06-06-2017, 05:53 PM)TexBilly Wrote: Well, I think my top would be the all-Damascus, Ricardo. That one looks to be very impressive. The Damascusis is certainly beautiful and the most expensive. I do like the look of the Zirconium, and the fact that it's lighter than the Damascus. One is doing well with either one. 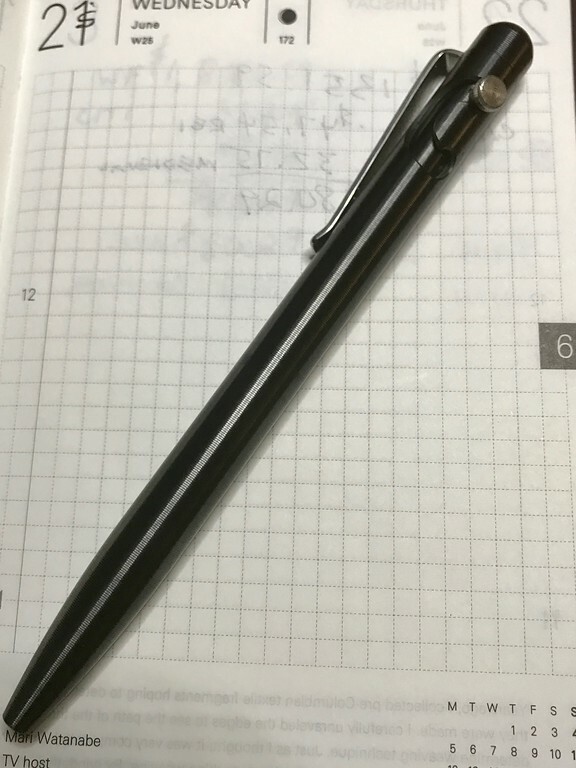 (06-06-2017, 03:21 PM)Johnny Wrote: I want one of those titanium pens with the dark coating on it. My wife really loves my LE pen. Yes, like this one. And as usual, your pictures are not helping my pocket book any. Don't make eye contact with the pen. Went straight to my local engraver after getting the pens in the mail. Didn't really spend time with it or take any pictures. Doh! From the weight, however, I think I'm leaning toward the Titanium, the copper may be TOO heavy. We shall see when I get them back. Did anyone go and get their custom engraved? I'm getting my name on mine. (06-08-2017, 01:51 PM)GloryUprising Wrote: Went straight to my local engraver after getting the pens in the mail. Spencer, I have a copper Glider and it is on the heavy side. Copper is the heaviest metal Will offers. It's not too heavy for me, but I can see why someone else could have an issue with the weight. I'm going to order a Titanium Glider, which weighs 1.3 oz., compared to 2.30 oz. for the copper. I'm looking forward to comparing the two. 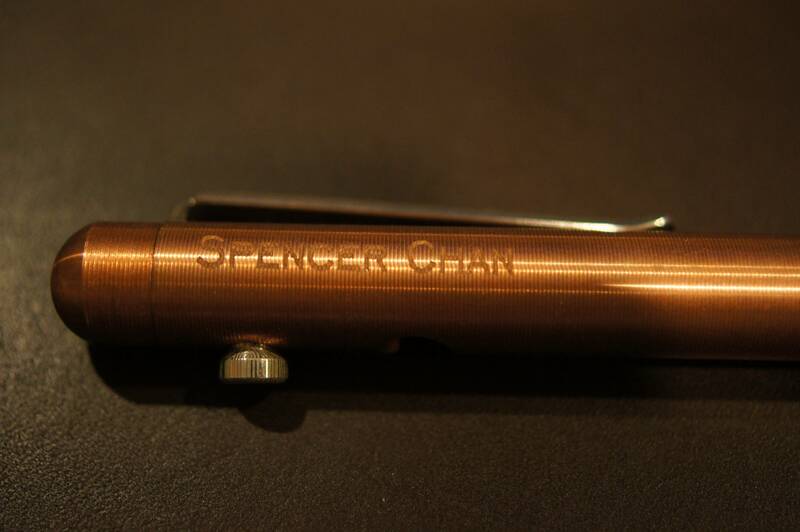 Please post pictures when your pens return from the engraver. 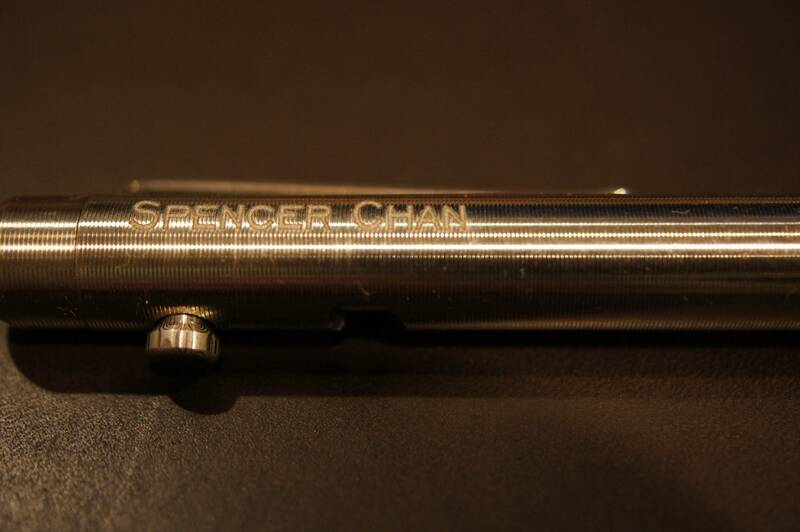 The engraving turned out nice Spencer. Nice touch having them engraved, looks great! Spencer, now that you have the lightest and heaviest models, how do,you feel about the weight of the copper? 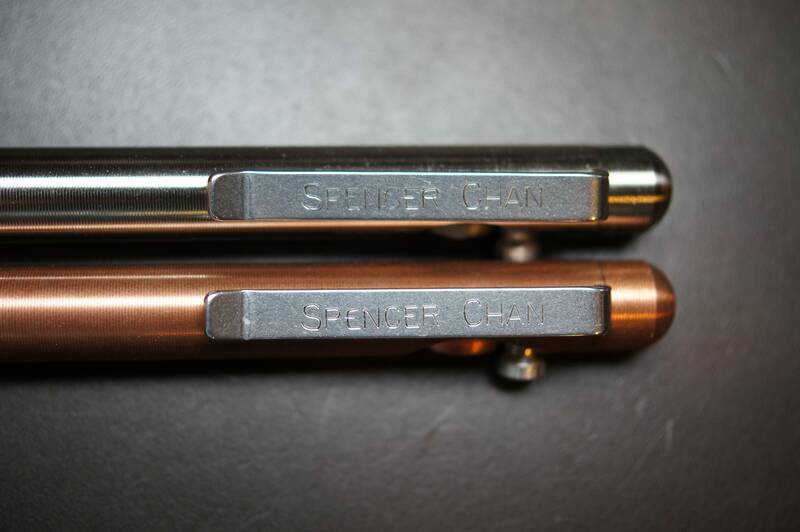 (06-17-2017, 12:02 PM)TheLegalRazor Wrote: Spencer, now that you have the lightest and heaviest models, how do,you feel about the weight of the copper? The copper is very top heavy and makes my hand writing a bit scribblely. I am slowly adjusting however. I do notice when I use my old uniball 207s that my hand writing is a bit neater. Perhaps I'm exercising my hand muscles more. 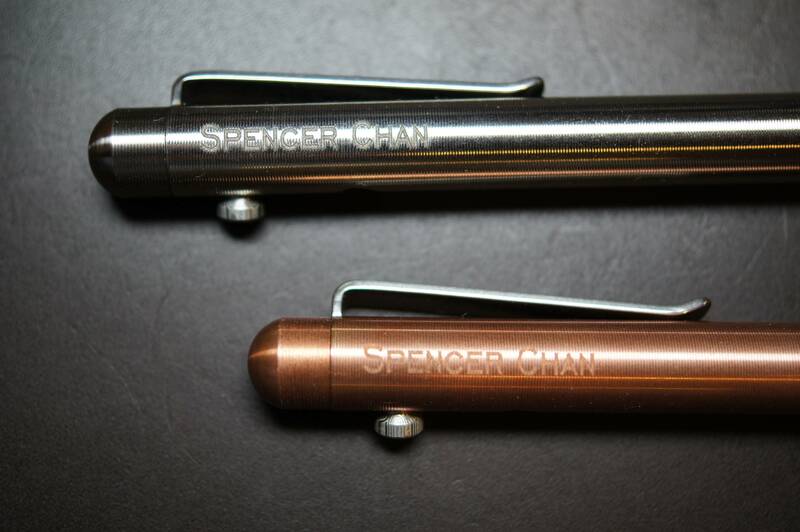 The titanium is actually very comfortable so I have a feeling that will me my professional pen at work while the copper will be my EDC. 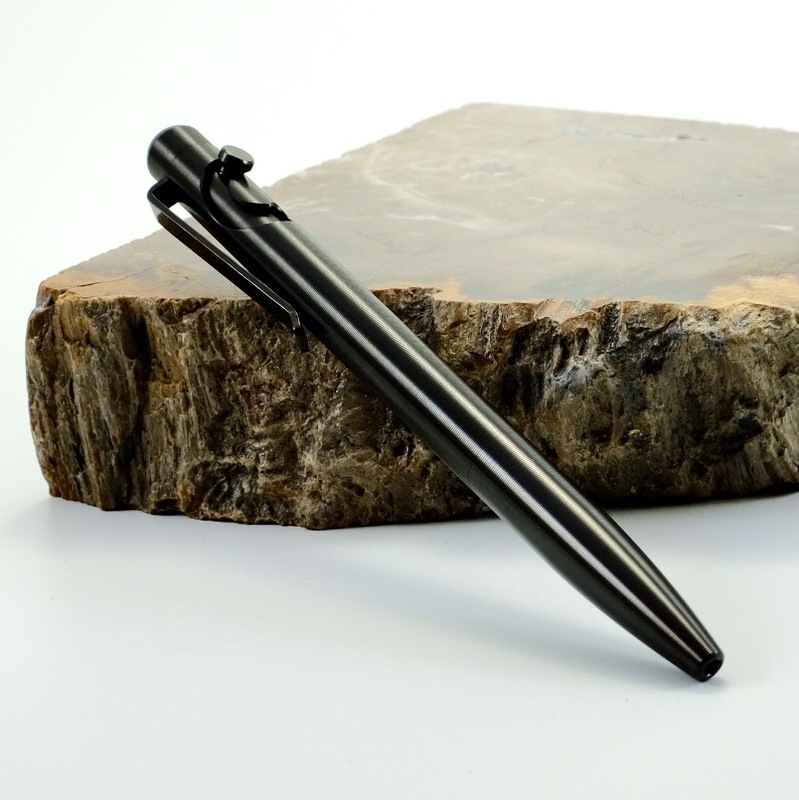 I started to look at other bolt action pens.... And I ordered a different titanium pen.... Another rabbit hole we are going down. Spencer, let's see that one when it arrives! Beauty Mark! 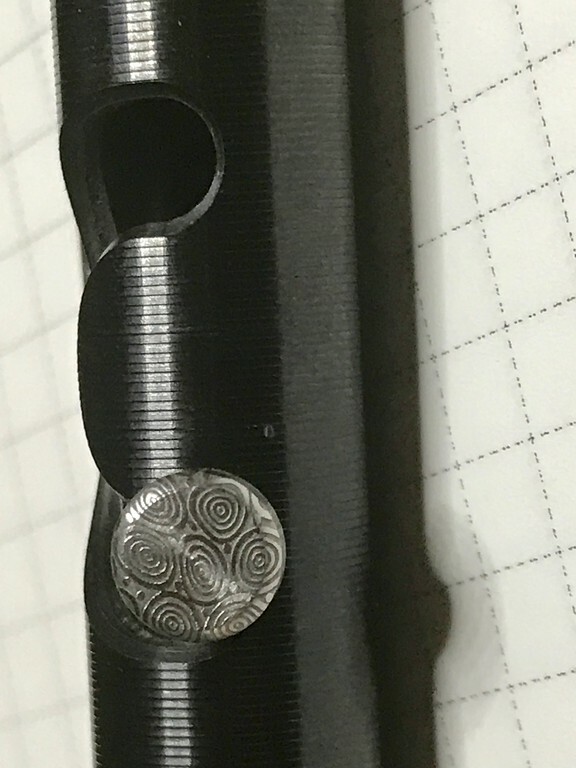 Great detail on the bolt. Nice looking pen all around, Mark! The damascus detail "shows" more obviously than I would have thought. Congrats! (06-24-2017, 03:53 PM)TexBilly Wrote: Nice looking pen all around, Mark! The damascus detail "shows" more obviously than I would have thought. Congrats! Very nice Mark. I have Gliders in Copper, Brass, Stainless and Titanium. After seeing your Zirconium Glider and Ed's DLC Coated Titanium Slider, I may want a Glider in both those materials also. They sure look sharp in black.